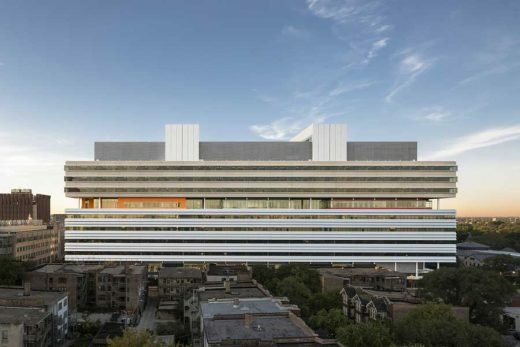 Rafael Viñoly Architects is proud to announce that the 10-story, 1.2 million-square-foot Center for Care and Discovery at the University of Chicago Medicine will open in February 2013. 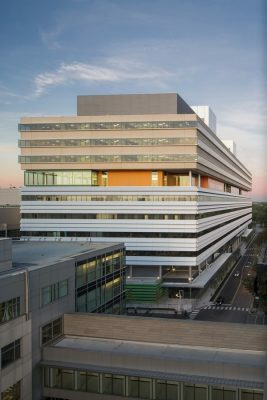 An architectural and technological tour de force, the Center for Care and Discovery (CCD) uses design to foster collaboration and interaction among doctors, researchers, clinicians and staff to continue world-class science and medicine while putting the patient at the center of care. “It is a design for the future that allows rapid integration of new technologies for advanced care in a way that maintains the patient and family at the center,” said Jeffrey B. Matthews, MD, surgeon-in-chief and chairman of the Department of Surgery, University of Chicago Medicine. Cannon Design served as Consulting Architect/Medical Facilities Planner on the project, with Affiliated Engineers, Inc. and Primera Engineers, Ltd., serving asMEP/FP engineers; and Thornton Tomasetti serving as the structural engineer. When the University of Chicago Medicine (then the University of Chicago Hospitals) issued a Request for Proposal for a new hospital, the aim was to expand an existing facility. Over the course of the preliminary design discussions, however, Rafael Viñoly Architects successfully proposed that the medical center view the project as an opportunity for construction that would meet the institution’s long-term needs. The resulting building occupies not only the given site but also bridges across Maryland Avenue to a site to the west. This connection advances the hospital’s goal of maximum efficiency because it allows varying functions to be contiguous to one another and reduces the need for staff to travel between floors. The building was designed to accommodate continually changing medical technology and practices; in particular, the 18-foot (5.5-meter) floor-to-floor height and large 31.5-by-31.5-foot (9.6-by-9.6-meter) structural square grid, developed in collaboration with Cannon Design, allows for extraordinary level of flexibility for reconfiguring departments and upgrading equipment. The Center for Care and Discovery will focus both on providing a patient-centered experience and on using the latest technological innovations to improve health care. Striving to provide comfort and convenience to patients and their families, the flexibility of the modular design also addresses the importance of evolving with advances in surgical, imaging and therapeutic technologies over time. The design supports the delivery of high-tech care for complex illnesses, multi-organ transplants, robotic surgeries, cancer treatments and gastrointestinal diseases. The focus on the patient can be experienced on multiple levels throughout the center. All 240 private patient rooms can comfortably accommodate multiple family members. 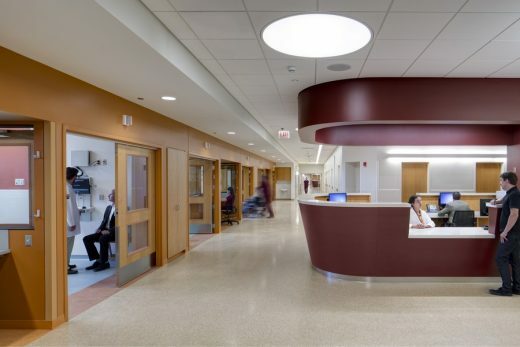 Privacy was a design priority in the patient rooms, as was expanding the visual connectivity between patients and nurses. Waiting areas close to patient rooms and nursing stations are accessible from the main elevators. These family waiting areas and lounges will provide communal space for visitors on patient floors. The Sky Lobby on the seventh floor houses central reception, family waiting areas, a chapel, a business center, cafeteria, conference center and other public spaces. As the heart of the hospital, this Sky Lobby effectively lifts the social, contemplative, outdoor space of a traditional campus quadrangle into the air. For families waiting for several hours, the grandness and uniqueness of the Sky Lobby allow visitors to find their own space and define their waiting experience. The Sky Lobby provides visitors with expansive views of the university, Washington Park, Lake Michigan, and the downtown Chicago skyline. Architecturally, the Sky Lobby also provides an important visual break in the vertical mass of the building, as the interior spaces on this level are recessed from the main exterior enclosure. The University of Chicago Medicine and its Comer Children’s Hospital rank among the best in the country, most notably for cancer treatment, according to U.S. News & World Report’s survey of the nation’s hospitals. The University of Chicago’s Pritzker School of Medicine has been named one of the Top 10 medical schools in the nation, by U.S. News’ “Best Graduate Schools” survey. University of Chicago physician-scientists performed the first organ transplant and the first bone marrow transplant in animal models, the first successful living-donor liver transplant, the first hormone therapy for cancer and the first successful application of cancer chemotherapy. Its researchers discovered REM sleep and were the first to describe several of the sleep stages. Twelve of the Nobel Prize winners have been affiliated with the University of Chicago Medicine. Visit the University of Chicago Medicine blog at sciencelife.uchospitals.edu and our newsroom at uchospitals.edu/news. Rafael Viñoly Architects, founded in 1983 and based in New York City, is an internationally renowned architectural firm with offices in London and Abu Dhabi. The firm has completed an unusually large number of diverse projects spanning five continents that range in scale from laboratory casework detailing to master planning. Over the past quarter century, the practice’s key trademark is the ability to reinvent institutional typologies and integrate the public realm into civic buildings. 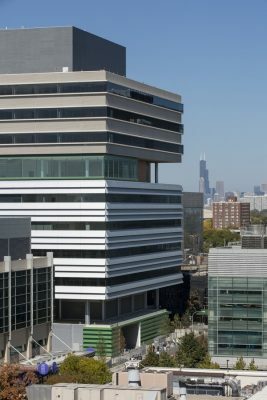 The firm’s projects includes: award-winning courthouses; museums; performing arts centers; landmark convention centers; athletic facilities; banks; hotels; commercial, industrial and educational facilities, including the acclaimed Charles M. Harper Center at the University of Chicago’s Booth School of Business; laboratories; and recreational and residential commissions. The firm has also completed several projects involving the restoration and expansion of large-scale buildings of significant historical and architectural value. Rafael Viñoly Architects’ recently completed and critically acclaimed healthcare facilities include University of California, San Francisco, Institute for Regenerational Medicine Building, Penn Medicine Translational Research Center and University of Texas Health Science Center at San Antonio, South Texas Research Facility. The firm’s most recent healthcare designs include the New Stanford Hospital (opening 2017), and a new biomedical education and clinical center for the University of Pennsylvania Health System (under construction). An Ideas-Based Practice, Cannon Design is ranked among the leading international firms in planning and design for healthcare, research, education, corporate, sports and government clients. At present, the firm employs a staff of over 1,000, delivering services in 15 offices throughout North America, as well as in Shanghai, China, and Mumbai, India. Since its founding, design for healthcare has been a cornerstone of the firm’s practice, with over one billion square feet of healthcare facilities in ten countries around the world. Long recognized among the top 10 design and delivery firms in the U.S., World Architecture’s most recent global survey ranks Cannon Design as 11th place overall. In its specialty practice of healthcare, most current standings include placement at number 3 from World Architecture, 5th place in Modern Healthcare’s Construction and Design survey and 3rd place in Interior Design’s Interior Giants survey. Most recent assignments for healthcare include the 2.5 million sf Centre hospitalier de l’Université de Montréal (CHUM). 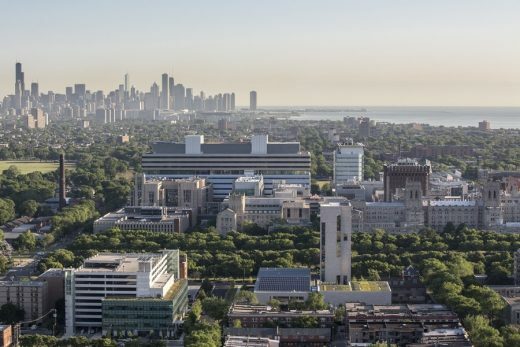 Serving 345,000 ambulatory patients, 22,000 inpatients and 65,000 emergency patients each year, CHUM will be the largest healthcare project in North America upon its completion. Opening in 2012, the Gates Vascular Institute/Clinical Translational Research Center has already received recognition from the AIA as well prominent professional journals. 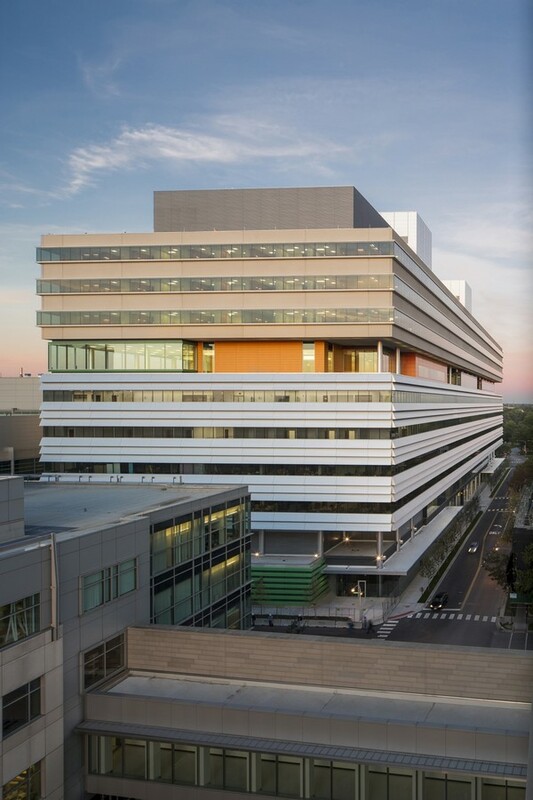 The 476,000 sf 10-story campus stacks a translational research building over a clinical vascular institute, connects doctors and researchers from varying specialties to meet in a variety of dynamic situations to accelerate medical discoveries—moving science from the bench to the bedside.